Good morning! It's been awhile since I've done an installment of my series: Portrait of Omaha. If you're unfamiliar with it, it's a photographic/informative look at some of the landmarks of the city I call home. 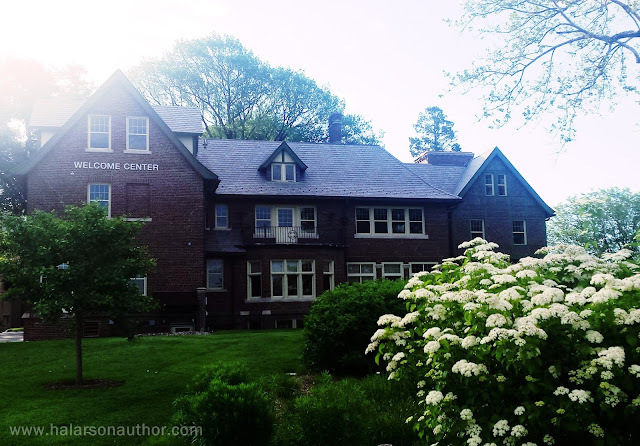 I've been meaning to cover the University of Nebraska - Omaha (a.k.a. UNO) for awhile now, but I've been waiting for Spring to arrive. The reason for this is that Spring is a great look for campus, and showcases the beauty of the university. This is glimpse of the Welcome Center with the Durham Science Center peeking through the back. A good look at the Welcome Center. See the flowery bush there on the right? It's part of a larger patch of foliage that hides a little secret: There's a little path that meanders through the patch, allowing one to escape for a moment and admire nature. A view down the sidewalk under the covered walkway at the Durham Science Center. 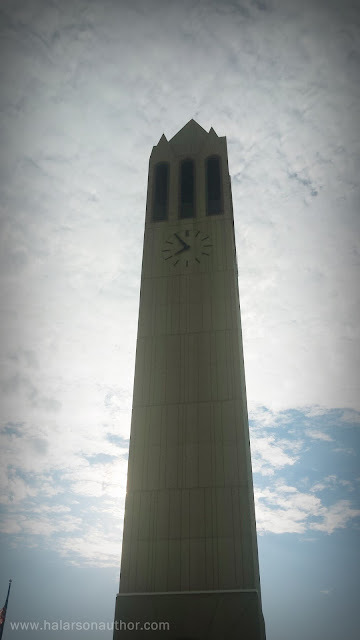 You can see all the way down past the Weber Fine Arts Building, through the covered walkway of Criss Library, and just barely make out the base of the Henningson Memorial Campanile (also known as the Clock Tower). The entrance to the Durham Science Center. This is where all the science-related fields are, and they also have a small, but impressive, planetarium. I was fortunate to go check out a laser show there with my family last year. 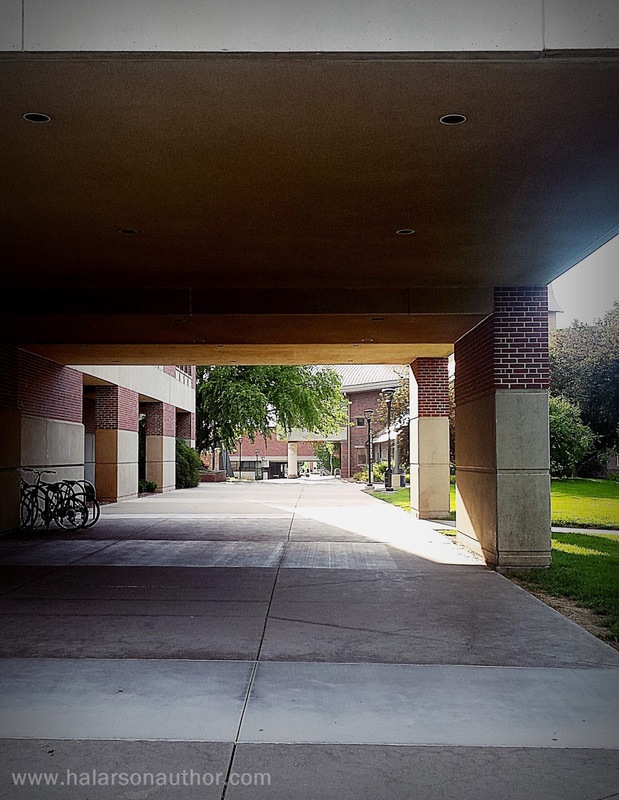 This is a neat art alcove along the main walkway through campus. It's got this neat-looking obelisk-type structure on the right, but inside are winding rows for planting flowers (which hasn't been done yet) and a small variety of sculptures. I'll have to find out more about this one of these days. 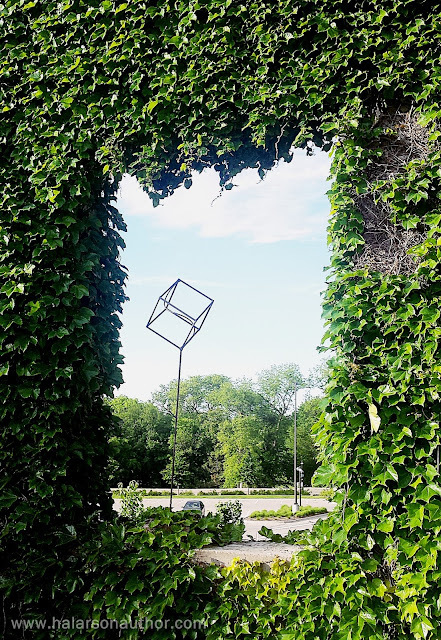 Just east of the Weber Fine Arts Building -- on one of their decorative outdoor walls -- is an open window that is framed with ivy and looks out, onto a wire-frame sculpture. This interesting sculpture is called "Atomicity" made by Ronald K. Parks. 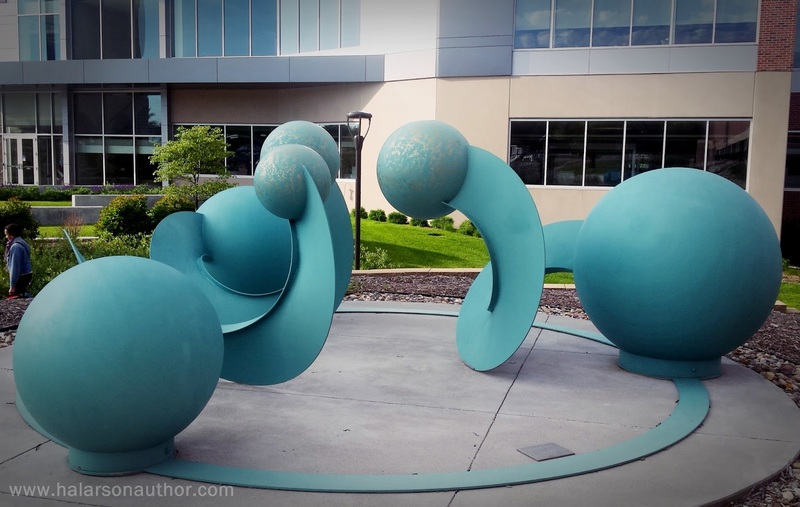 Installed in 2014, it sits outside of the Community Engagement Center. Here we finally get a good look up the Clock Tower. From this viewpoint, it seems to rise almost endlessly into the sky. 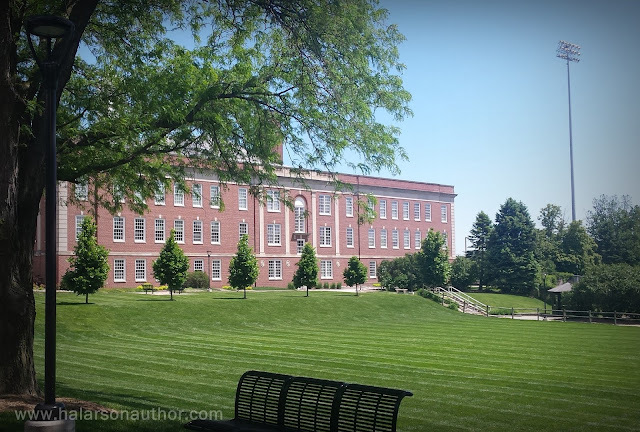 A view of the Arts and Science Hall from the back entrance of the Eppley Administration Building. The big, open, green space is the Pep Bowl where plenty of student activities are held on nice days. 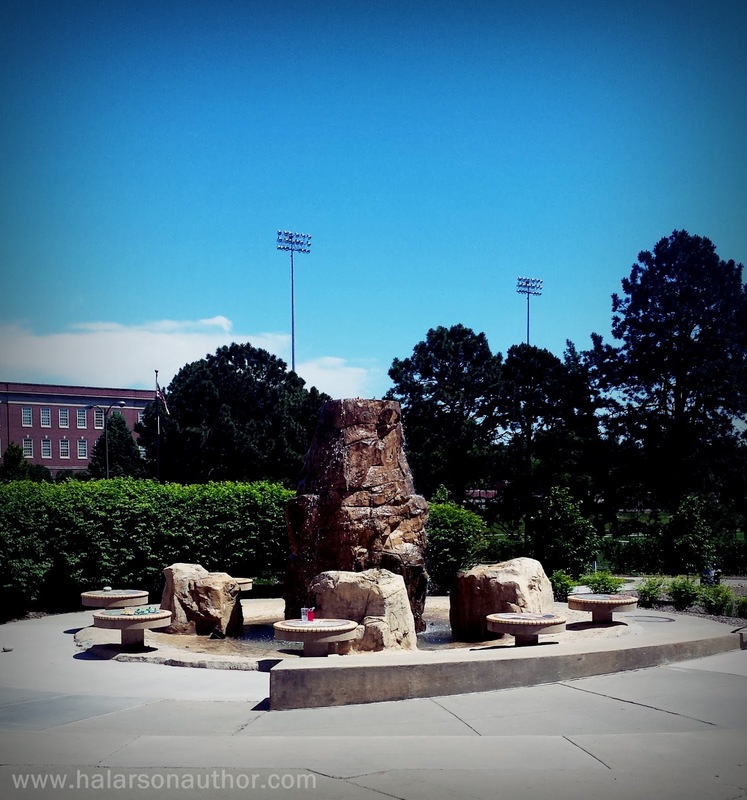 This is a cool fountain sculpture, complete with places to sit, just outside the back entrance of the Milo Bail Student Center. When the weather is nice, facilities puts out metal patio furniture for people to sit out in this nice open area. It's a great place to have lunch if it's not too hot. 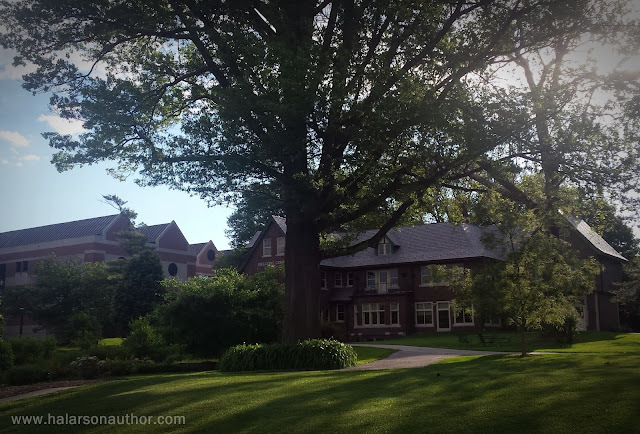 I hope you enjoyed this small glimpse into the campus of the University of Nebraska-Omaha. 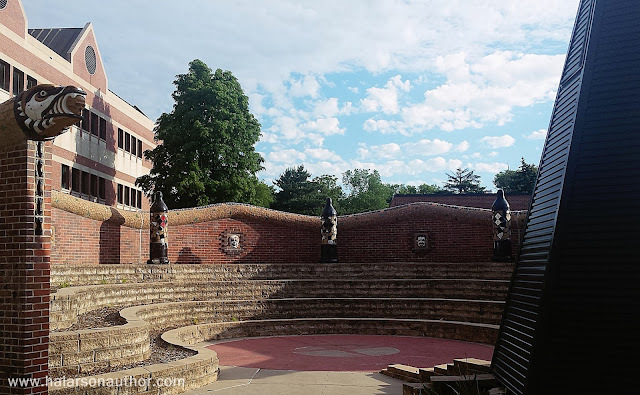 There are plenty of other interesting sculptures, foliage, and buildings to see here, and I hope you get a chance to wander around campus someday. 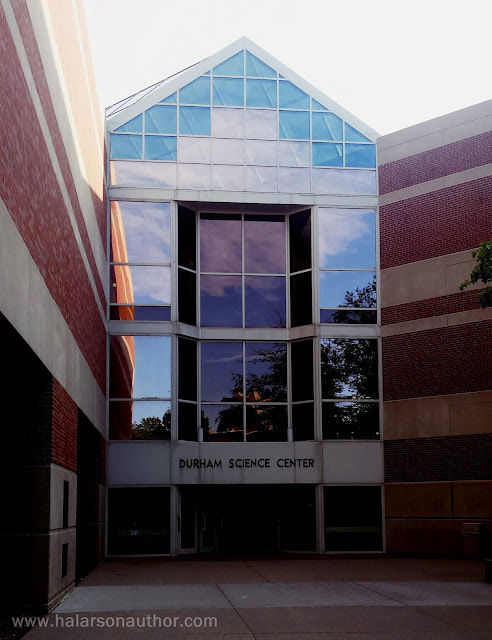 You can catch a show at the Durham Science Center Planetarium, check out the art inside the Weber Fine Arts Building, grab a bite to eat the Library Cafe, or simply take a scenic walk. Don't forget, my latest book The Box was just published Friday, and it's a hot buy at only $3.99. It's a short, fun, and thrill-ridden horror story, so check it out! You can find it here: H.A. Larson's Pronoun Author Page. I have read this blog and saw the beautiful images of the university. This is useful article for students, I would like to share a link of Typical Student, you may read more blog here concerned with students.